TABASCO® brand Original Red Sauce --- 2 oz. TABASCO® brand Green Jalapeño Pepper Sauce --- 3 oz. Thick-cut bacon slices --- 8 ea. Frozen thick-cut (1/2 to 3/4 in. wide) fritter-coated onion rings, uncooked --- 4 ea. Burger patties, each 6 oz. --- 4 ea. Whole eggs, cooked sunny-side up --- 4 ea. Combine TABASCO® Original Red Sauce with brown sugar. Lay raw bacon slices on a sheet pan; coat in brown sugar mixture and bake in a 350°F oven. In a bowl, combine black beans, onions, cilantro and TABASCO® Green Sauce. Using a stick blender, smash these ingredients together, then fold in cheese. Place this bean mixture into a small pot and warm until cheese melts. Toast broche buns and fry onion rings. Grill or griddle burgers until cooked to desired temperature. 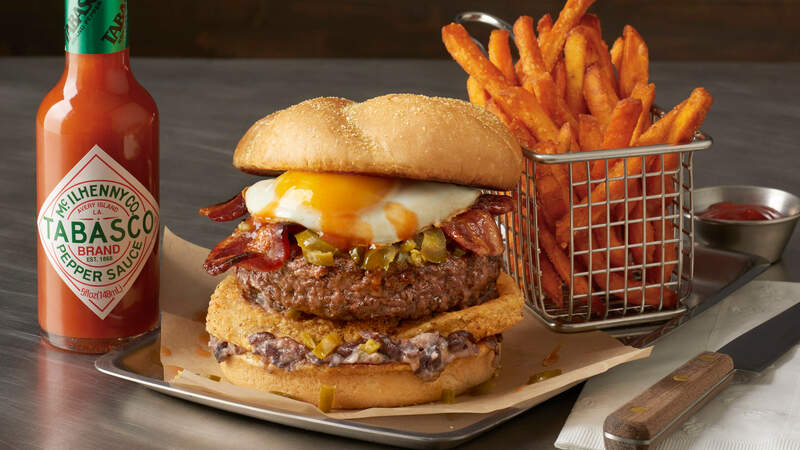 To assemble each burger, place an onion ring on the bottom of a bun, fill the center with the warmed black bean mixture, and lay a cooked burger over the top. Place 2 Tbsp. green chiles onto the burger, 2 strips of bacon over the green chiles, and 1 sunny-side-up egg over the bacon. Cover with top of bun, and serve.